I have lost my passion: why should I keep it . . . ? Ah, collectors. When I was but fourteen and moving from my childhood home, because by then my sophistication and maturity knew no bounds, I gave away all of my sports and non-sports cards to my younger next-door neighbor Jimmy. Kid’s stuff! A complete set of Davy Crocket orangebacks! A generous batch of Topps World on Wheels. Presidents, airplanes, science-fiction—not to mention the baseball cards my older brother had bequeathed to me. And we all have our stories of the comic books tossed, burned, or neglected. 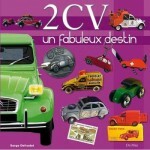 There are many branches of collectables and collecting, each with its own peculiarities. Numismatics: If the date on a 1842 $5 gold piece in mint condition that has been produced in Charlotte, North Carolina, an 1842C, was stamped in a small size, relatively speaking, it is worth in the neighborhood of $75,000; if the coin has the more common large-date, and it too is mint, the book value is closer to a trifling $12,000. We are not talking of the date in a difference in inches here—the difference would be measured in fractions of millimeters. Philately: The airplane was mistakenly printed upside down—if you absolutely have to have one, you might consider a second or third mortgage. Art: You just paid a cool hundred mil for what sure looked like a genuine Jackson Pollock only to find that after X-rays and a rigorous, microscopic study of a minute paint chip from the piece, that it is not genuine at all. With a brigade of lawyers, critics, curators and scientists, not to mention the incessant drain on your bank account to finance all of this expertise, and if you are of a lucky sort, perhaps you will, in the end, be vindicated. The fact that if it takes lasers and electron microscopes to tell the difference—look, let’s not go there. Classic automobiles: Four doors? Forget it. Coupé—better. An open car? Now we’ve got your attention. Do all the numbers truly match? 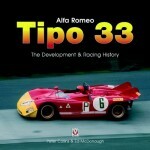 Now we are in automotive heaven. Toys: “Play wear”? The value drops. Got the box—let’s talk turkey. 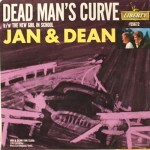 Can’t afford the gold coins, the rare stamps, a forty-year-old Detective Comics with pristine white borders on the inside pages, a copy of Introducing the Beatles LP, (an LP that came in variations that have been a boon to LP collectors ever since) with the super-rare back cover with ads from other Vee-Jay artists Frank Ifield, Jimmy Reed and The 4 Seasons among them, a Franay-bodied Bentley Continental, an original Magritte or a Hubley toy “Red Devil” Racer #5? 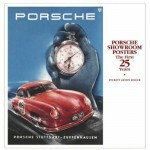 If so, consider collecting the catalogs and price guides. Think about this. There are folks among us who will pay close to fifty dollars for an Overstreet Comic Book Price Guide from the 1970s, a few hundred dollars for an early Lionel Train catalog, or close to a thousand dollars for a leather-bound 2008 copy of The Official Red Book of United States Coins. What gives? And the same question can be asked for the Number 33 Arcade Toys catalog here under review. We have a running joke in our house. If everyone were like me, there would be no room in the world; if everyone were like my wife, there would be no museums. To reach a happy balance, lately I have been sorting through the stuff gathered and collected over the last several decades for the purpose of letting much of it go, a de-accesion if you will. In doing so, I came across this item and I have absolutely no recollection from where or whom it was acquired. 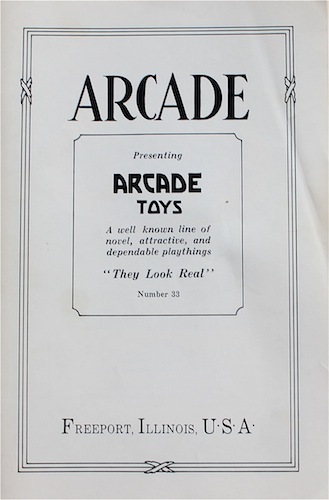 The text on the cover reads “Presenting Arcade Toys/A well known line of novel, attractive, and dependable playthings/“They Look Real”/Freeport Illinois, U.S.A. What is missing altogether is any sort of publishing/copyright page. Never mind an ISBN. What puzzles and frustrates me is that nowhere in this publication is a date to be found. There is no asking price on the cover. The toys illustrated throughout the pages are obviously from the 1920s, the condition of the book is quite good and I suspect it is a reprint. 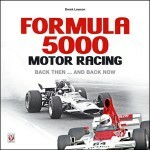 But wouldn’t a reprint be more likely to have dates, the original date and the date of the reprint? Wouldn’t there be a $3.95 somewhere on the cover? Have I stumbled on something of real value here? You got me. After the usual on-line searches, I was unable to track this one down. The catalog is obviously for retailers. For each item, we get the dimensions of the toy itself, the packaging dimensions, the number of toys in each package and the materials that make up the packaging. A Yellow Cab with a six-inch wheelbase, for example, comes “in a paper carton, one dozen in a case—case net 45 pounds, gross 55. Case measurements 21 ¼ x 11 ¾ x 10 ¼ inches.” This information is of interest, but no prices are listed, another source of frustration; and, too, there is no address or phone number to be found. Would each retailer already have this information? If this is a reprint, was this information purposefully left out? 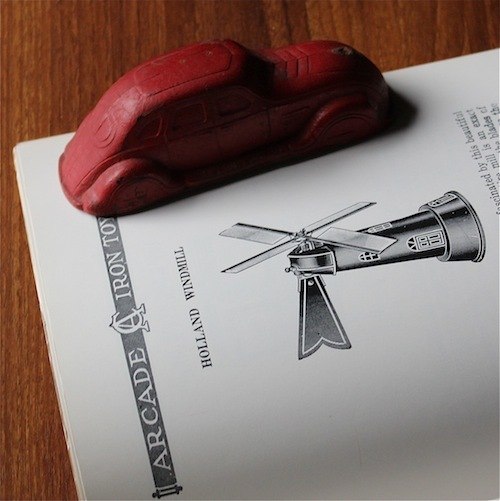 The back page is a comprehensive index, offering toy cars, banks, doll house furniture, tractors, plows, horse drawn coaches and others. What makes these toys even more attractive is the fact that many of the toys are not generic, but based upon brand names, A C F coaches, Buick and Chevrolet cars, Crane pedestal sinks, Hotpoint stoves, Mack trucks, McCormick-Deering tractors and Weaver wreckers. While pursuing this book, it would take a hard heart indeed to not find a stab of sweet nostalgia, a memory of the purity and delight of childhood or a longing for a supposedly more innocent and less hurried era. Toy cast iron cook stoves; old-time busses and horse-drawn carriages; coin banks modeled as animals, buildings or boats; “modern” sinks, refrigerators, bathtubs and “closets.” An unending appeal. Keeping in mind that this a sales catalog, it is also fun to read through the copy; phrases such as “an attractive toy which is a special inducement to prepare a banquet for a doll family,” “a very desirable item for the spring trade, although they sell strongly all throughout the year,” “the modern play sand pile demands a motor dump wagon to perform the really efficient work for its youthful owner,” and “a modern toy that sells itself on sight” remind us that this is a business proposition after all. 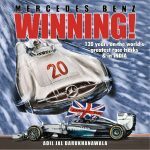 Picture a derbied man in small retail in a small town grumbling as he had to use this book to stock his shelves, to reorder. 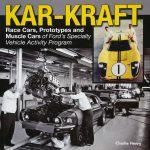 Real rubber tires are available for the various cars and busses, but at a “nominal cost.” Perhaps, today, the most unusual thing about these toys is that they are all made in America. 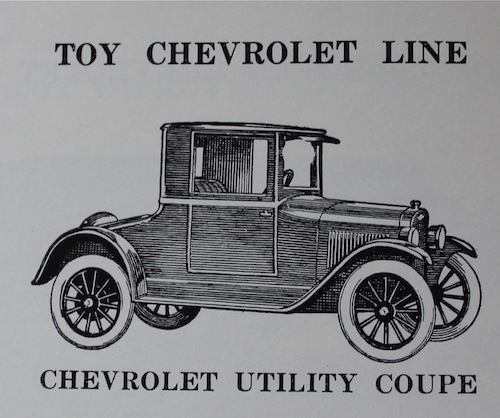 And, when looking at the illustrations, there is an indication of—or, at this point in time, perhaps merely a hope for—a certain pride in manufacturing such wondrous toys for deserving, wide-eyed children. 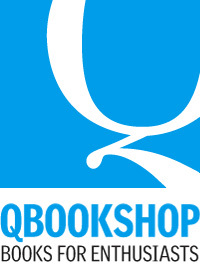 The illustrations are the heart of the publication. It wouldn’t be wrong to picture many of them, perhaps enlarged, framed and hung in a study or den. Some appear to be steel engravings, and these would be at home in a Max Ernst collage. Others seem to be ink line drawings, and others look like ink washes. Rugged toys are depicted, and most are quite handsome. Go to eBay, search “Arcade Toys” and you will find that some still look new, and the bright paint still gleams; but the real beauties are the play-worn ones with patina, character. 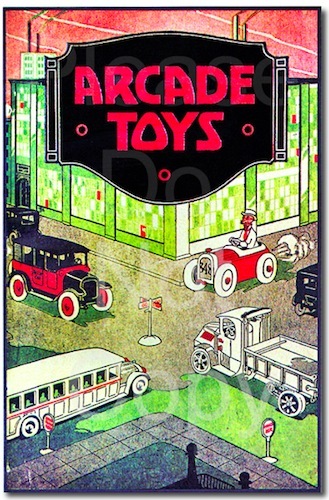 But the illustrations in Arcade are not Rockwellian images of a well-played toy, banged-around and dented like the real thing—remember the company motto, “They Look Real”—but rather they are crisp and spanking new, like a new-car catalog. They are elegant and regal and hoping to sell, proud and strong against a quick wash of a sky, or, more commonly throughout Arcade, a nice commercial art piece, direct and to the point, but done with satisfaction by the commercial artists. These artists are not credited, but imagine a piece of work finished by some fellow in a green eyeshade, red-ribboned sleeve garters and using his pen wipe, who once longed to out-paint the Giaconda, who might say, “Hell, yes, I’m not ashamed of this.” The illustrations in Arcade are like that. Let’s pick one at random. 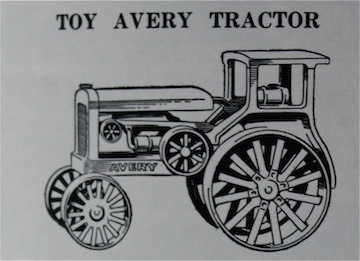 Page 45: The Toy Avery Tractor, “an excellent model of the Avery Tractor formerly made by the Avery Company,” “an inexpensive item that represents big value.” It is an ink drawing of a tractor with large steel rear wheels that are driven by linking the pulley from the engine’s driveshaft to the rear axle; there is a little hut for the driver and a radiator reminiscent of a Model A Ford. The lines are quick but precise. Avery is sharply lettered on the frame for the engine mount. 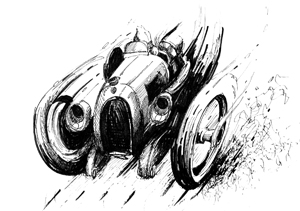 Deep India ink shadows give weight and form to all four wheels, but especially on the near rear one, heavy, robust. This toy, unlike the Heavy Toy Dray found across the way on page 44, has no driver. The dray’s teamster is drawn, as is the dray, not as a depiction of a real wagon sweeping through some busy construction scene, but as a drawing of the toy itself. You can sense the heavy casting of the toy man, the stiffness of the arms and legs, the hard shell of the face. Again, this is a more than a competent rendering; it reflects the skill of a proficient commercial artist. 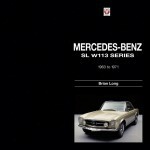 If you are fortunate enough to come across a copy, it will hold a valued place in your collection of catalogs and price lists. Will I keep to the courage of my conviction, the conviction that at a certain point in life (Do I dare to eat a peach?) some, if not most, of the accumulation of stuff should be allowed to change hands, collector to collector, the courage to de-access? If I have sparked your interest in Arcade, and if I ever get around to it, maybe you will find my copy listed on eBay in the not so distant future. Copyright 2013, Bill Wolf (speedreaders.info).